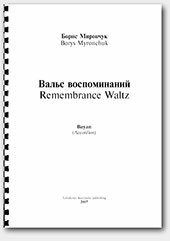 You can buy Remembrance Waltz by Borys Myronchuk in compilation "Waltzes"
Video demo: Borys Myronchuk. Remembrance Waltz. Performed by Borys Myronchuk ANIMA JAZZ QUARTET, 2014. Video demo: Borys Myronchuk. Remembrance Waltz.